The recent technological breakthrough in the industry of concrete machinery is one of the reasons for the growth of construction industry. This is one of the leading industries in the global market. There is hardly any country in the world where the business of construction is not experiencing the maximum growth in the present days. The growing demand of high-class real estate projects is the reason for this growth. To satisfy this growing demand, the concrete industry is using advanced machines. One of them is the latest concrete pipe making machines. The global demand for this machine is very high. To understand this demand, you have to have an insight into the progress of this machine. To fulfill the demand of best quality concrete pipe machine, you must have the most advanced machines in your possession. Only a reliable and efficient pipe making machine can provide you with the most useful concrete pipes as per the requirement of your industrial as well as commercial construction projects. To perform the task of pipe making in a flawless manner, some creative advancement should be made in the machines. Certain parts of the machine must receive some advancement to create the best quality products within the minimum possible time and fulfill the global demand. Based on the type of the machine, the production cost and efficiency of the products can be determined. 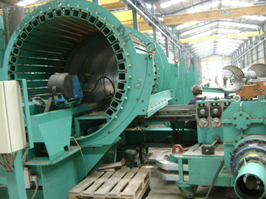 Concrete pipe making machines are used to produce concrete pipes only. However, you can ranges of such machines on the basis of the shape and size of the pipes that are produced through those machines. For the large and heavy concrete pipes, huge machines are used. They are difficult to transport from one place to the other. On the other hand, there are machines that are used to create small but long concrete pipes. The inner segments or parts of these machines are different as per the size and shape of their products. There are some countries where the construction business is reaching the highest limit. France, India, Japan, China, America, and Germany are some of those countries where the construction industry is considered as one of the leading business sectors. Thus, you can find the highest demand for concrete pipe making machines in these countries to fulfill their requirements of concrete pipes for various industrial as well as commercial projects. The advanced machines can help to get the standard product of pipes as per the needs of the individual projects.